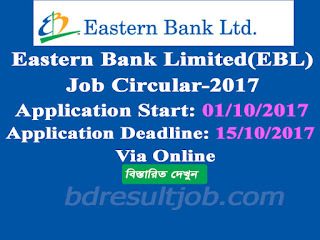 Eastern Bank Limited Branch Manager and Relationship Manager Job Circular 2017 published in www.ebl.com.bd. Interested and eligible candidates can apply online via Eastern Bank Limited e-recruitment system at http://ebl.bdjobs.com/ApplyToJobs.asp. There are some rules and restrictions for apply. If you Eligible candidate can apply for the position this job, you should submit your application Please log on to www.ebl.com.bd/career and apply on or before October 15, 2017. • Eastern Bank Limited offers excellent career opportunities with most competitive salary and benefits package. Note: EBL is an equal opportunity employer and welcomes applications from female candidates. Any persuasion will disqualify the candidature. Only short listed candidates shall be invited for the interview. Eastern Bank Limited (EBL) admit card visit official website www.ebl.com.bd. Bank authority will be notify the applicant about exam date and admit card download by www.ebl.com.bd/career. Eastern Bank Limited (EBL) seat plan visit official website www.ebl.com.bd. Bank authority will be notify the applicant about exam seat plan download by www.ebl.com.bd/career. Eastern Bank Limited (EBL) result visit official website www.ebl.com.bd. Bank authority will be notify the applicant about exam seat plan download by www.ebl.com.bd/career. Tags: www ebl com bd/career. www ebl com bd. eastern bank job circular october 2017. Apply online through www ebl com bd, Eastern Bank Limited (EBL) Admit Card Download 2017, Eastern Bank Limited (EBL) seat plan, Eastern Bank Limited (EBL) result 2017. 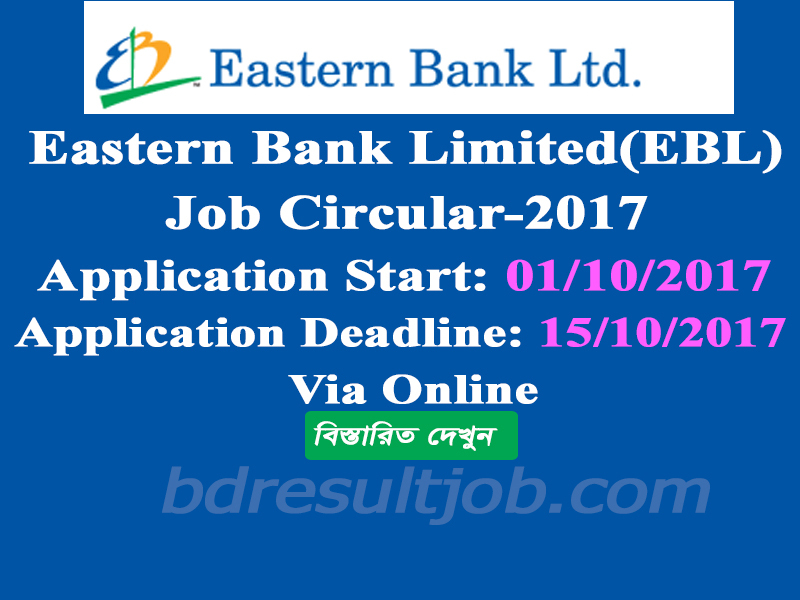 Eastern Bank Limited (EBL) Branch Manager and Relationship Manager Job Circular 2017,Eastern Bank Limited (EBL) Admit Card Download 2017, Eastern Bank Limited (EBL) seat plan, Eastern Bank Limited (EBL) result 2017.